ORIGIN SPECIALTIES: This Green Unroasted Arabica coffee is sourced from family-owned farms in the Kochere district. Because of its high altitude of 1800-2200 meters and NATURALLY ORGANIC FARMING PRACTICES, wild heirloom varietals and iron-rich acidic soils, the district of Kochere is a prime area for producing an impeccable example of what YirgaCheffe has to offer. FLAVOR NOTES: Ethiopian Yirgacheffe coffees are renowned for their beautiful herbaceous floral tones complemented by hints of fruit and vibrant citrus acidity for a complex and flavourful cup with a sweet, silky mouthfeel and a crisp, clean aftertaste. SOCIAL IMPACT: Close to 100,000 local inhabitants rely on coffee as their main crop with which to feed their families. ABSOLUTELY NO COMMITMENTS, NO OBLIGATIONS! Morning Hills Coffee aims to fulfill all who our part of our coffee world. You can be assured that with each cup you are enjoying excellent coffee while positively impacting the life of the local growers and their community. Kochere is southwest of the town of Yirga Cheffe and near a little village of Ch'elelek'tu in the Gedeo zone of Ethiopia. 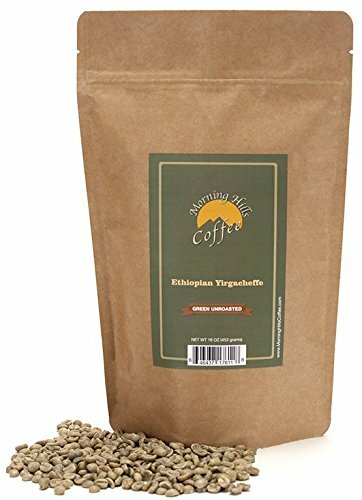 It has long been known as one of the best origins for southern Ethiopian coffee. Kochere is growing in popularity, highlighting the stable diversity of Yirgacheffe's unique attributes. Through establishing long-term relationships with these communities, both coffee distributers and consumers take part in helping to empower these farmers to become self sufficient and strengthen the local community and family structure. We chose to partner with Yirgacheffe Coffee growers because we love to provide great tasting coffee for our customers while immensely impacting the local community where the coffee is grown. With each full cup of coffee you can be fulfilled knowing you are enjoying great coffee and making a difference in the lives of the local coffee growers. Consider purchasing 2 lbs to start with and experiment with different roasting times to find that optimal taste that best suits your needs and preferences. GUARANTEED SATISFACTION and NO OBLIGATIONS!! !